See also the updated cmdlet Help online. For more information, see AuthenticationType Enumeration. The -Verbose switch is now able to show the full-blown connection string that is issued to Microsoft Dynamics 365. 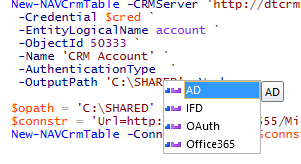 See below an example with an on-premises Active Directory authentication connection string. These postings are provided “AS IS” with no warranties and confer no rights.